Stage Manager, or Show Director? We were finally on-site. It was six months ago that we started working on this particular multi-million dollar event and we had already spent more than 100 hours with the event production company, client, venue and vendors answering every question from how we were going to tell the client’s story differently this year to load-in schedules to screen presets and run of show and everything in between. So much time had been spent on moving segments around, tightening up our show, editing videos to help tell the story more effectively and making sure we never lost sight of the overall event theme and branding. We even helped with the equipment list to cut some fat and help meet our budget. So when the event producer on-site introduced us to the entire crew as the “stage manager,” you can imagine that it seemed like our role had been slightly undersold. A stage manager manages the stage. He/she makes sure the stage is clear, that those presenting know where they’re entering & exiting from, that there’s water nearby, the “clicker” used to advance PowerPoint slides is either in the stage manager’s safe keeping or in the hands of the presenter and it’s also the job of the stage manager to communicate all of this to the person calling the show, which sometimes, on smaller jobs, is the stage manager. Stage managers direct people to the makeup and green rooms as well as the restrooms. Great stage managers entertain the presenters and make sure they’re feeling comfortable before their big moment in front of thousands of people. They calm nerves and answer the tough questions. They know the show backwards and forwards and often times have a long-standing relationship with the executives or people involved with the event. They double check to see that the downstage monitors are working and displaying what they should be displaying. And the best stage managers can run rehearsals and block segments while the show director (or show caller) advances the next day’s showflows and schedule or puts out fires with the technical crew. 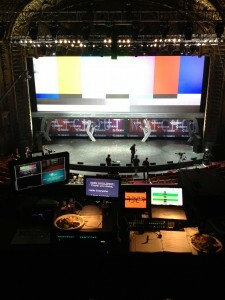 Stage managers aren’t necessarily worried about what content is being put on the main screens in the room. Stage managers aren’t concerned with the overall story nor are they concerned with tightening up the show or making sure the overall theme of the event is obvious. They shouldn’t concern themselves with video rolls and screen presets nor should they be worried about specific lighting cues and cueing the band or special effects. During the 80’s and 90’s, it was the lighting designers (aka LD’s) who had their work cut out for them. Before multiple video screens and sync’d media, before LED panels and Spyder & Encore presets, LD’s typically called the shows since most of the cues dealt with lighting. It was a natural fit. And a lot of LD’s were quickly becoming TD’s (technical directors) so TD’s would often times call the shows. But things were simpler back then. Calling a show meant you gave specific spotlight cues, you told the LD when to fade the lights down and when to restore. Back then, TD’s might have called for a few videos and given “go” cues to a stage manager backstage. Today, media is king. And unlike lighting, it’s always changing. There’s a video look for when people enter the room, a video that kicks off the event, 30+ videos throughout the event that can be anything from commercial spots to product launches to sales success stories. And usually these videos come in all different sizes and formats. It’s not uncommon for someone to walk in 20 minutes prior to doors with a YouTube link. It seems as though there’s more hustle these days when it comes to media. Less programming time. More of a “fly by the seat of your pants” mentality. And, unfortunately, most of it stems from the client, not the producer. In addition, the complexity and uses of graphics have increased over the past few years. Media servers like WATCHOUT!, Pandora and Hippos have become commonplace and having more than 10 screens on which content needs to be displayed is no big deal. Five years ago, if you had more than four screens, you were using a ton of technology. Today, four screens is considered a small event. As with most things related to technology, it’s because the equipment is smaller, lighter & brighter and easier to make that it is also more affordable. And creating engaging content has become more affordable to producers and clients since we’ve seen the overall democratization of media globally. So what does a show director do anyway? As we see it, the show director is the link between the event producer and the client. The client and producer come up with ideas and it’s the responsibility of the show director to clearly communicate these ideas to the staff & crew to ensure flawless execution. It’s the show director who comes up with the best way to pull these requests off and formalizes everything in an easy-to-follow run of show (or showflow as we call it). The show director controls the chaos. Another role of the show director is to aid in the transitions of the event. Making sure there’s music when executives enter and exit stage, that you have something to cut to in between those moments than can easily become awkward or clunky. Clock management, or learning how to shave minutes off of the presenter’s clock as needed, are other skills the show director should excel at. The show director also works closely with the technical director to ensure the crew has breaks and knows what’s next in the day’s schedule. Call times, meal & bio breaks, rehearsal schedules, work calls and what needs to be improved, fixed, setup, added, etc… are all things that fall under the show director’s list of responsibilities. Knowing which screens will have certain content helps me with transitions and unique presentations that fall outside the “normal” presets. We also like to make sure that we are calling the media files the same thing so there’s very little confusion when hard drives are handed to video playback. You’d be surprised how many possible different names there are for a simple highlight video. In essence, the show director directs the show while a stage manager manages the stage. To be honest, when we’re show directing a big event, we really don’t worry about managing the stage since we’re usually working with a talented stage manager like Ann Friday. She owns that world, and although we work really well together, we try and divide & conquer vs. overlap. So what does a show caller do anyway? A show caller, in our humble opinion, is very similar to a show director. Our theory is that event producers struggle with using the term “show director.” Not sure why. Maybe it’s because they’ve been around long enough to remember when our jobs didn’t entail so much or they come from theater where the stage manager was on comms, calling cues, setting furniture on stage, mic-ing executives and presenters, etc. But since the explosion of media being used in today’s events, we don’t think it’s fair to call a show director or show caller a stage manager in the same sense that we would never dump the duties of a show director on a stage manager.